So distracted had I been by Rio Ferdinand’s Roger Moore tribute show yesterday that I forgot to mention the other salient Brentford and World Cup news from Sunday. Firstly, Gary Lineker’s awkward ‘reveal’ of the trailer for the new series of Doctor Who was the straw that finally pushed me to ITV. Don’t get me wrong, I like a quick spin in the Tardis but the almost embarrassed segue from half time analysis in a, supposedly advert free show, killed the mood of the game stone dead whilst, at the same time, setting my more geekish tendencies into an elevated state of nerdery. It was an unnecessary distraction that just pushed me to the light channel. If we were going to get adverts and hideous monsters, then I may aswell just go for the full Adrian Chiles experience. From Rio Ferdinand’s jacket to this…. 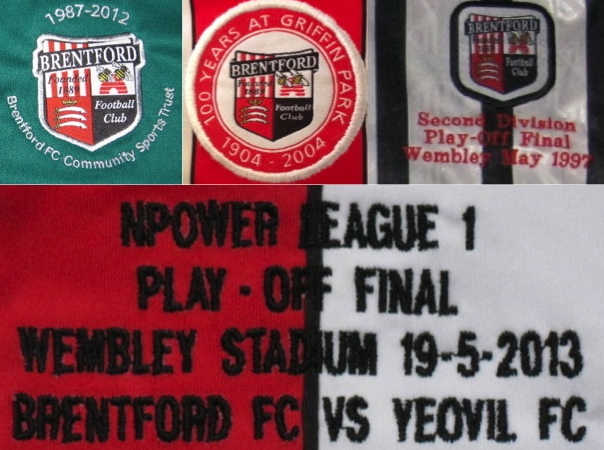 From a Brentford perspective, there were also more snippets of shirt news lurking out there in cyberspace – a preview much more welcome than a face full of daleks. A quick trawl of twitter will help you locate these but I’m very pleased to hear that the castle badge will return in some form on merchandise in the club shop. More importantly, it seems the club are looking at one part of the 125th anniversary celebrations being a game with some commemorative wording added to the badge on our new shirt. With the potential for some of these to be on sale, too, I can already hear Mrs. Bruzon hiding my wallet . It did also get me thinking about what is the correct protocol for this sort of commemorative wording? Around the club badge in a circular pattern or horizontally – whether underneath it or more centrally? My own preference is for the horizontal – under the club badge. I’m not an owl and so, bereft of the ability to rotate my head through 360 degrees (or whatever it is they can do) struggle to read the circular text. Does it matter? Probably not. I’ll still buy one if the possibility arises but I just know what I prefer – whatever the rules are on this sort of thing. 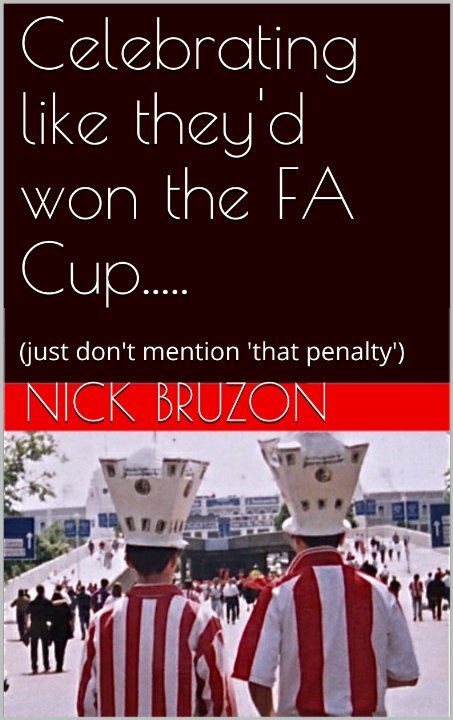 ‘Celebrating like they’d won the FA Cup…..’ (The story of Brentford’s 2013/14 promotion campaign, amongst other football related chatter) – is now available as a digital book. Featuring the best of the not so bad columns from last season, and some new content, you can download it here for your kindle / digital device. Rio? Roger? Changes at Griffin Park? Is Rio Ferdinand swapping Manchester United for a new role at Easyjet? Or perhaps a Royal Navy commander? Given the commentary on social media last night, he might even have found time to fly Brentford back from the Florida training camp. 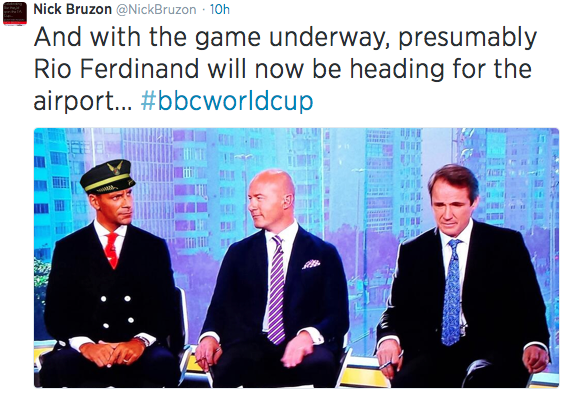 The World Cup ended with a win for Germany and the BBC panelist attracting as much interest in his suit as his punditry. Twitter was awash with comments about one of the most talked about bits of fashion since Liverpool rocked the ‘Man from Del Monte’ look at the 1996 FA Cup final. These are all over the internet now (my own effort below) with, surprisingly, former England captain Michael Vaughan being amongst the chief protagonists. However, despite all the gentle ribbing pointed at Rio he’s actually in great company. It is universally accepted that Roger Moore is, hands down, the best man to ever fill the role of James Bond. 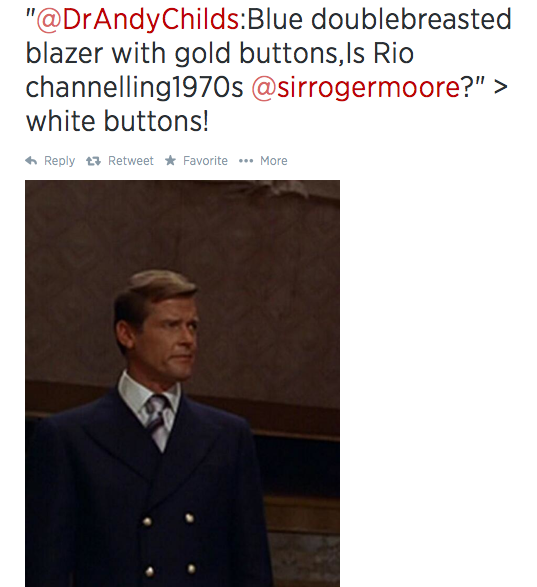 Indeed, much of the classic Moonraker saw 007 based in Rio de Janeiro where, of course, last night’s final took place. As such, it was some what fitting that the best of the observations about Ferdinand’s jacket was not an airline related gag but one that showed what esteemed company he is in. Nobody can carry off a safari suit/blazer/polo neck like Roger and so the mantra must have been, “If you can’t beat them, join them”. Back in TW8, a stroll past Griffin Park at the weekend revealed two things. Firstly, we remain none the wiser as to who the roof sponsor will be on the New Road. A peek through the gap in the fence by the ticket office reveals this to be still covered in undercoat. Despite our proximity to Heathrow, there’s been no sign of Rio up a ladder with a few tins of the budget airline’s trademark orange paint. 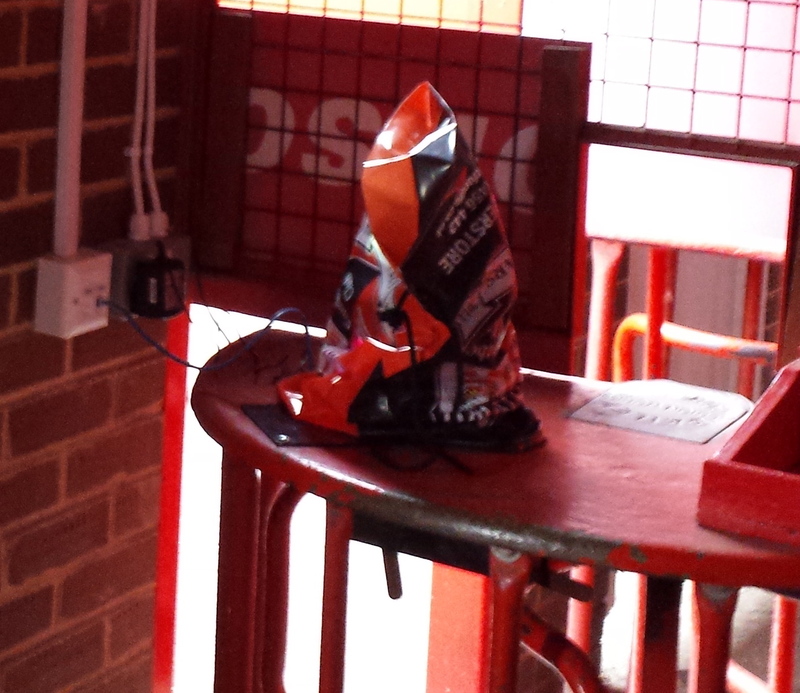 And then looking into the turnstile, there is a mysterious object lurking under a clubshop plastic bag. The same thing appears in each one and so I can only presume this is the much anticipated ‘electronic ticketing system’. Not quite up there on the ’shirt’ reveal but when things are this quiet, I’ll clutch at any straw of Brentford related news. Roll on the pre-season friendlies. Please. It’s just over a month until Brentford begin their Championship campaign against Charlton Athletic. I don’t think I’ve looked forward to a season this much since 92/93 – it really does promise to be THAT exciting. However, with the World Cup almost having run it’s course then how else can fans fill the void until the return of league action? Well,for anyone suffering ‘Manish withdrawal symptoms’, there is still the chance to relive it all again. On holiday, on the way to work, even on the toilet. As has been mentioned previously ‘The Last Word’ has been turned into an e-book. The best of the not so bad bits from the last campaign have been collated, tweaked, had some new material added and become a season diary of 2013/14. Entitled, “Celebrating like they’d won the FA Cup…. (just don’t mention that penalty)” it is now available for your kindle. This your chance to remind yourself how Brentford went neck and neck with Wolves or celebrated like they’d won the FA Cup at Leyton Orient. The mixed reactions to Marcello’s return and the shock departure of Uwe. Not to mention a new stadium in the offing. Naturally, it focuses mainly on our attempt to escape League One for the Championship but, as anybody who has looked at this column over the last season will be aware, there are as many diversions into the general ‘goings on’ in the wider world of football. Adrian Chiles, Fulham’s self-destruction, Vincent Tan, No to Hull Tigers, the national team and THAT band. Just for starters. Running from Celtic in pre-season to the denouement of the play off campaign, you can get it now. Enjoy. Suffered from an accident at work that wasn’t your fault? 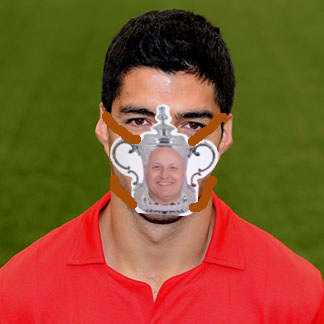 I can only imagine Luis Suarez is sitting at home right now, ringing through to the local equivalent of those ‘ambulance chasing’ compensation lawyers that alternate advertising space on ITV4 with payday loan sharks. That is, if his anyone actually swallows his side of the story about the ‘bite’ on Giorgio Chiellini. As excuses go, it’s pretty pathetic: “Serial biter blames accidental stumble for latest assault on his teeth”. It’s up there with ‘The Dog ate my homework”, “My P.E. kit is in the wash” or Crystal Palace supporter Matthew Simmons’ assertion that he was just going to the Selhurst Park toilet and mentioned to a passing Eric Cantona that the number 7 (seven) should take an early shower. And the worst thing about the Suarez case is that Diego Maradona, the previous panto villain of the World Cup, suddenly has the moral high ground after his 1986 ‘Hand or God’ (or, ‘punching the ball past the goalie’ as it is known in our house) knocked England out of the tournament. At least he subsequently admitted what he had done. It didn’t make it any better to take but there was no attempt to come with an excuse that even Fergie (and this is the man who once blamed a defeat on his own team’s choice of grey shirt) would have been embarrassed to use. Getting back to matters domestic, I found this list of various team’s ‘celebrity fans’ and their occupations whilst trawling the interweb last night. It makes amusing reading with some generous descriptions of what said supporter is known for and, perhaps, gives some clue as to which Championship ‘C-listers’ could be occupying the Brentford director’s box next season. There’s no Rhino out of Status Quo for us although I’m pleased to see the inclusion of a ‘TV Broadcasting Big Cheese’ (their words) even if it isn’t Natalie Sawyer. Clearly, a list that needs updating. That, or the Brentford PR people need to work harder. If only they’d mentioned it before….